Have you noticed that it's hard to find warm hats nowadays? Used to be you could walk into any ski shop and get a wool ski cap (lined or not) that would get you through pretty much anything Mother Nature could throw at you. These days I find ski shop hat racks dominated by lightweight beanies and the occasional wind-stopper fleece cap. Both are great—they certainly have their uses. But on those bitter cold December mornings when the wind is screaming and Ma Nature is really trying to sink her teeth into you, I find myself just wishing for a good, old-fashioned heavy wool ski hat. Everest Designs' Sherpa Hat recalls the glory days of the wool ski cap. It is a thick, hefty hat, fleece-lined, with flaps to completely cover your ears. Most importantly, it is abundantly warm, a perfect choice for the most ferocious weather. 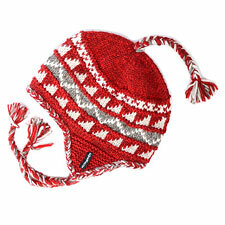 That shouldn't be too surprising: these hats are hand-knit by women's "knitting cooperatives" in Nepal. If figure if there's one thing the people who live in the shadow of Mt. Everest know, it's the value of a good, warm hat. The only area where the Sherpa goes (possibly) awry for me is its styling. I'm going to call it unisex with some trepidation. There are a lot of tassels here. Tassel-free versions of Everest Designs hats do exist, though you'll probably have to search around for them. As for just cutting them off an existing Sherpa hat, well, that does seem a little disrespectful to me, and just in case I ever find myself visiting Everest, I do want to stay on the mountain's good side. So, for me the tassels stay. Though the design of a lined wool hat may be old-fashioned, the performance puts most modern fibers to shame. These hats seem to effortlessly get the mixture of wind protection and comfort/breathability just right. The only downside to the Sherpa hat, potentially, is its level of insulation. It is very warm. For milder days, you'll definitely want a lighter hat.